Sometimes called the most desirable form of financial aid, scholarships are a great source of "free" money for college. That's because, unlike student loans, they don't have to be repaid. And there are many to choose from—worth billions of dollars each year. 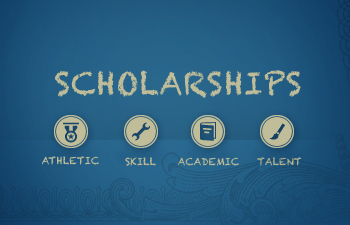 Scholarships typically come from philanthropists, the government, corporations, or colleges or universities. But they can also come from places you wouldn't necessarily think of, like local businesses, clubs, charities, and religious groups. Some organizations and industries offer scholarship benefits in exchange for service after graduation. This happens a lot in health care and the military, and the commitment is usually one year of service per year of scholarship support. Need-based scholarships. These are awarded based on your family's ability to afford college. Combination need- and merit-based scholarships. Applicants of these scholarships are evaluated based on both financial need and individual talent. Any of these scholarships can be offered to students of a particular race or ethnicity, gender, disability, geographic area, college or university, or field of study, or those who participate in a certain extracurricular activity, club, or organization. Deadlines typically fall between October and March, so your student should start applying around the beginning of the school year, if not sooner. And it's good to remember that high school students aren't the only ones to get this type of financial aid. There are many scholarships available for current college students to apply—and reapply—for each year. Both high school and college students should meet with their school advisors for more information on scholarship opportunities.